Many travelers who earn frequent flyer miles aren’t always interested in booking an award ticket. Instead, they want to use their miles to upgrade a ticket they’ve already bought with cash. Upgrades and award travel have a lot in common, but the rules are unique for every loyalty program. This post discusses how to upgrade a ticket purchased with United Airlines. There are two important rules for booking upgrades on United. It’s very important to understand these before you book a ticket as any mistakes could require expensive change and cancellation fees. Please ask your questions here or contact a United representative for clarification. First, you must use miles in your United MileagePlus account to upgrade your United-operated flight; any miles earned with another loyalty program will probably not be helpful. Second, upgrade inventory is limited. Just because there are business class seats for sale does not mean that you can upgrade your economy class ticket. Like award flights there are only so many available (because the airline would rather get cash instead of miles), and this changes often. 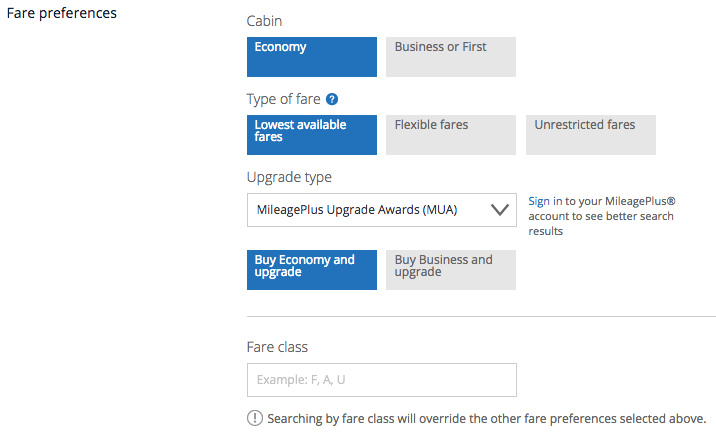 However, if a business class award is available then it is likely that an upgrade is also available. Because award availability is often limited, upgrades make it easier to secure travel on the flights you need when the destination and dates aren’t very flexible. You may need to fly even if your upgrade doesn’t clear. You’ll be stuck in economy, but will get to your destination anyway. There are also some people who don’t want to travel any more than they already do, or they need to continue booking paid tickets in order to earn the miles they need for elite status. Booking more award travel doesn’t appeal to everyone. Knowing how to use your miles for an upgrade is still a better option than redeeming them for merchandise or gift cards, which deliver very poor value. United’s program is more complex than most other airlines’ but has the advantage that many more flights are eligible for an upgrade and much of the process can be performed online. You can use United’s website to search for available upgrades before or after you book your flight, enabling you to compare options if you have some flexibility in your schedule. You can also specify certain fare classes when searching for airfare, since the fare class is a big factor in determining your rank in the upgrade hierarchy and the amount of the cash co-pay, if any, that you must provide in addition to the miles. For example, on the United homepage you should click on the link for “All search options” to visit the advanced search page. Near the bottom of that page is a section for fare preferences. Select “MileagePlus Upgrade Awards” from the menu and which kind of ticket you want to pay for (not the ticket you’ll have after the upgrade). You can enter one or more fare classes if you wish to take advantage of special upgrade rules for those fares. The results page will show not only the cheapest available fare (without an upgrade), but also the cost when booking an upgradeable fare that includes the necessary miles and the co-pay. You can also view the details under each itinerary — without jumping through all these hoops — to look at the inventory in specific fare classes. United classifies its upgrade inventory in the R fare class. (Some of these features may require that you activate United’s Expert Mode). To upgrade a flight operated by United Airlines, United Express, or Copa Airlines, you will need to redeem miles and provide a co-pay that vary depending on your destination, route, and the fare class purchased. Pricing for mileage upgrade awards can be found on pages 5-7 of this PDF or by using United’s interactive search tool. A small portion is copied below. For example, upgrading a one-way domestic flight within the Continental U.S. will cost 7,500 miles for a Y fare or 20,000 miles for a S, T, K, L, G, or N fare. There are other levels in between. These upgrades also require a co-pay that ranges from $0 to $250. On international routes between the U.S. and Europe, a typical upgrade to business class costs 20,000 miles and $550. The co-pay can be the biggest inhibition against redeeming miles for an upgrade. You should determine if purchasing a more expensive fare that allows you to reduce the co-pay is more sensible. Or it may be worth paying for a discounted business class ticket. If you want to upgrade a flight on any other Star Alliance member, then you must book a full price Y or B fare. These can be very expensive for international travel, and a discounted business class fare may be cheaper. It is also possible to upgrade from business class to first class, but there are still restrictions that require you to purchase a J, C or D business class fare. Fortunately there is no co-pay for Star Alliance upgrades. Not every Star Alliance member participates in upgrades, but most do. A typical price is 25,000 miles each way for travel between the U.S. and Europe. You can learn more about the special requirements of Star Alliance upgrades on United’s website. You don’t have to upgrade at the same time you buy. There is an online tool that checks availability inventory and provides an option to upgrade at any time before check-in. The same system is also used to apply other sorts of upgrades for full fare tickets or systemwide upgrade instruments. Travelers with elite status who purchase Y or B fares can receive complimentary upgrades on domestic routes and select international flights that travel shorter distances. Premier 1K members also get an instant upgrade when they purchase an M fare. These upgrades must be requested after ticketing; if upgrade inventory is not immediately available you can go back and request the upgrade again at any time. To request these upgrades after ticketing, or to upgrade with miles, go back to United’s website to access your reservation online and then select the “Redeem Upgrade” button at the bottom of the itinerary. The next page presents two tabs: the first lets you buy up to first class and will re-fare your ticket (not a real upgrade), and the second will let you use miles to confirm an upgrade. The cash co-pay will also be displayed. If a flight doesn’t have upgrade space immediately available (green check mark) then you’ll be placed on the waitlist (yellow triangle) and given priority ahead of any complimentary elite upgrades. You can even use your miles to upgrade someone else’s flight. Log into your United MileagePlus account and then access your friend’s reservation using his or her last name and confirmation number. Following the same steps as above you’ll be presented with some options to upgrade. However, your miles will be deducted if you choose to proceed with the upgrade. 1.Full fare tickets, which may be eligible for an instant upgrade, are processed first. These are ranked by fare class (Y > B > M). Within each fare class they are ranked by the passenger’s elite status. 2.Upgrades using miles or systemwide upgrade instruments are processed next. Neither one is prioritized above the other. These are ranked by the passenger’s elite status first, then fare class, and then the time of request (typically when the flight was booked). 3.Complimentary elite upgrades for passengers and their companions are processed last. Because of the importance of fare class in the upgrade hierarchy, you might find that it is helpful to buy a slightly more expensive fare to improve your odds. For example, K and L fares require the same co-pay and miles to upgrade a flight to Hawaii, but the K fare will be upgraded first. If the difference in price is $10, that may be worth paying to move up the list. You can search for specific fare classes on United’s website.